Pete O’Brien was my favorite player. He played first base for the M’s, back when the Mariner’s had yet to have a winning season. If you are saying “Pete O’Who?”, that’s okay. He was mostly my favorite player because he wore glasses and so did I. And I’m still pretty sure that’s a good reason. There is nothing I like more than playing or watching baseball on a sunny day. I remember playing ball with my dad in our yard and then cheering with him at the stadium. I remember thinking the Mariner’s were going to win (every time) even during the years when their bullpen lost it in the ninth (every time–except when they lost it in the eighth). I remember doing all of my homework with the games on the radio (Dave Neihaus, you are responsible for any bad grades). I remember getting into an argument about Dave Valle (catcher) with my Middle School Crush (now husband) that ended in him sitting (temporarily) on the other side of the movie theater. I remember wearing my M’s hat with duct tape over the “S” during the strike in 8th grade. I remember gleefully watching the postseason games with the Yankees in 1995 with a Yankee fan and personal foe. I remember Edgar’s double. As I’ve “grown up” (for lack of a better term), baseball still has me. At a recent Tiger’s game, I could feel my heart race just walking into the stadium, seeing the light reflect on the grass. I’ve lost a little of my loyalty to the major leagues, but paying attention to money and drugs will do that to you. And while you will never see me root for the Yankees, I’ve transitioned to a Tiger’s fan with little ado. Which is why I was excited to see Betsy’s Day at the Game come across my desk. 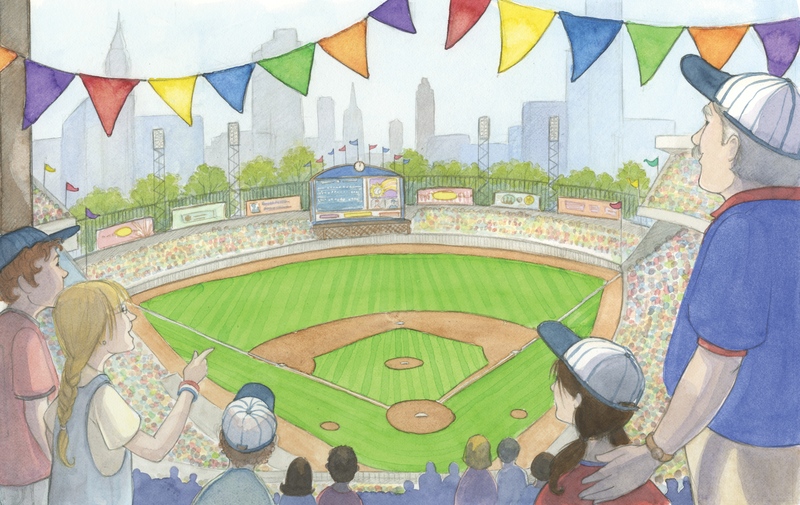 I love that the book is about a girl going to the game, as sports books often target boys. I love that it focuses on keeping memories along with the scores. And I love the way it integrates a story with a lesson on how to keep score, which is complicated business. I remember the first time I learned how to read a box score and to check player’s stats in the paper. Keeping score is a great way to watch a ballgame. It’s a great way to stay focused on the action. And it’s great for kids who are more numbers-oriented than sports-oriented: it might open up a world they never knew was there. 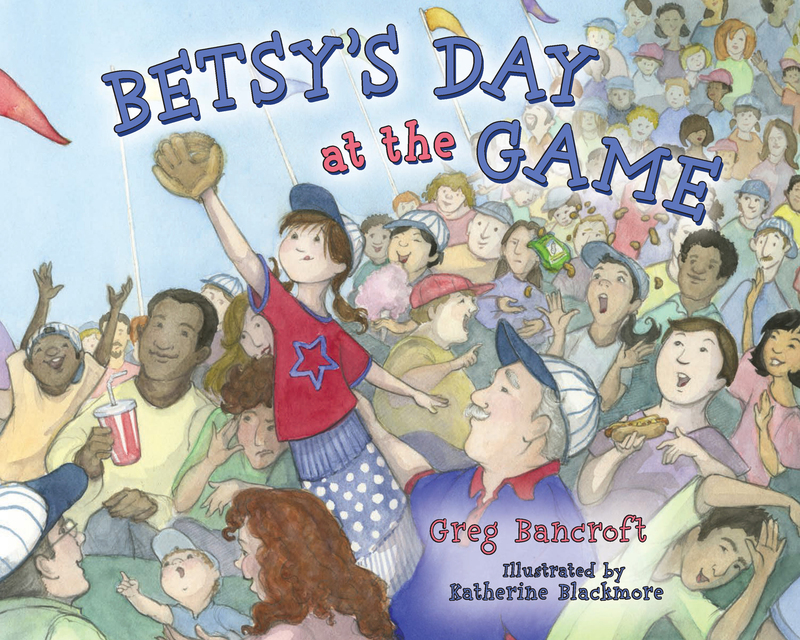 Betsy’s Day at the Game is the size of a picture book, but really an early reader, meant more for the adult to read to the child. It’s a text-heavy given the nature of teaching, but explains the game and score-keeping well. 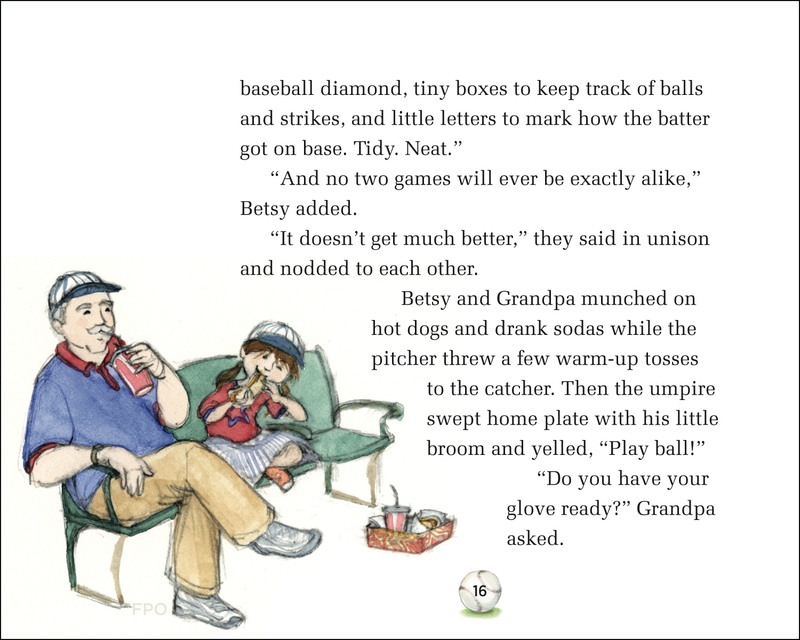 This is a book that brings it’s own family acitivity: simply read, head to the ballpark, and start keeping score! 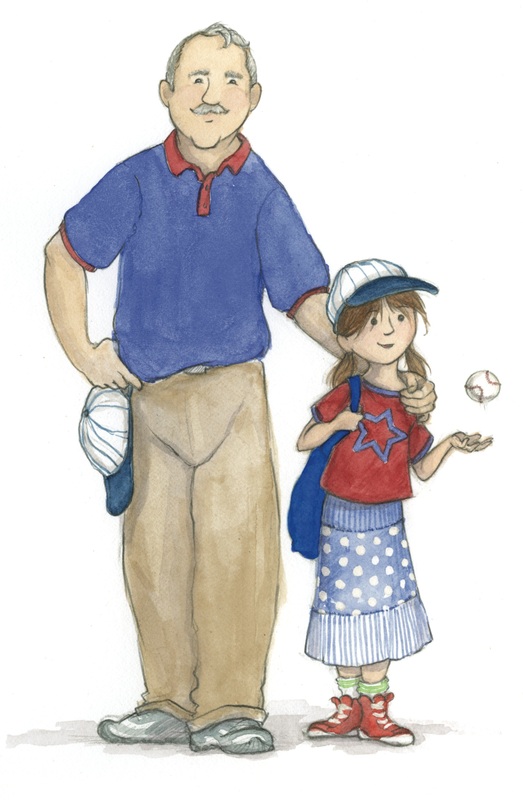 Don’t forget to include the family memories like Betsy does, and if you aren’t heading to a ballgame anytime soon, you could start your own memory book instead. And if you need some more baseball inspiration, I will end with a link to my absolute favorite essay ever, The Green Fields of the Mind, by A. Bartlett Giamatti. I won and you can, too! 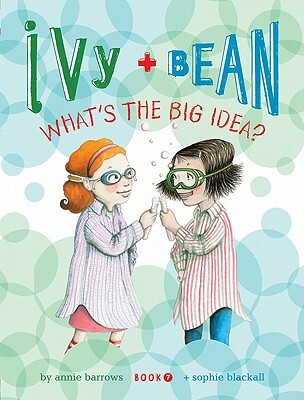 Ivy and Bean: the new book is here! Okay, I’ve been interrupted mid-post a million times, so I need to get this out before another week goes by. Here are the winners from Week 7. Week 8 seems to have disappeared into some kind of mother-of-2-who-just-moved-into-a-new-house-and-already-has-guests-and-construction-projects time warp. But no worries. This week, we celebrate week 9, where one of the past winners from all the blogs will get a totally cool prize package that includes Ivy and Bean dolls and other really great stuff (pictured below). Getting girls into science is a big deal. I wrote an article about this in ParentMap after a great study was published by the AAUW (American Association of University Women). One of the biggest factors they talked about was having role models for girls in science–that girls didn’t see themselves in the typical movie scientist (think old guy with white hair). So maybe reading Ivy and Bean is all they need! If you think so, and want a chance for your own daughter or student, just comment below! Title: Ivy and Bean What’s the Big Idea? And if you want to win this next book, What’s the Big Idea, Just comment below! Runners-up get a set of cool mini-notes. Ivy and Bean want to show that Bean’s sister is the WORST babysitter ever. Will they? Let me know your prediction in the comments below for a chance at a free copy of this book! REMEMBER TO INCLUDE an email address, or to check back and see if you won! I cannot give you anything if I cannot find you! And remember to check out these other cool blogs who are giving away Ivy and Bean books, too! Free free to enter there as well! Comment below WITH SOME WAY TO CONTACT YOU to win! Thanks to everyone who entered! Remember the prize package, which will go to one of the winners from all the previous weeks from all the previous blogs, is awesome! (See below) More books and notes each week for nine weeks! Come back soon! Remember, when you are done with a book, you don’t have to forget about it. Why not find some fossils with your kids? You could just dig in the backyard, or you could buy a fossil kit at a toy store or museum store, or you could make your own kit: take a toy, break it apart (a lego person or animal would work well), bury the pieces in some dirt or dried beans or rice or soil or whatever you like, and have your kid dig it up and see if they can put it back together and figure out what it was! Want to check out some other cool book blogs that are also, reportedly, giving away Ivy and Bean prizes? See below. Leave a comment below to win! And don’t forget to leave an email–or check back next week to see if you’ve won! Last week’s winners announced tomorrow. If for some reason I can’t find Gail, I will rerun the contest in one week. If you didn’t win this week, keep coming back! 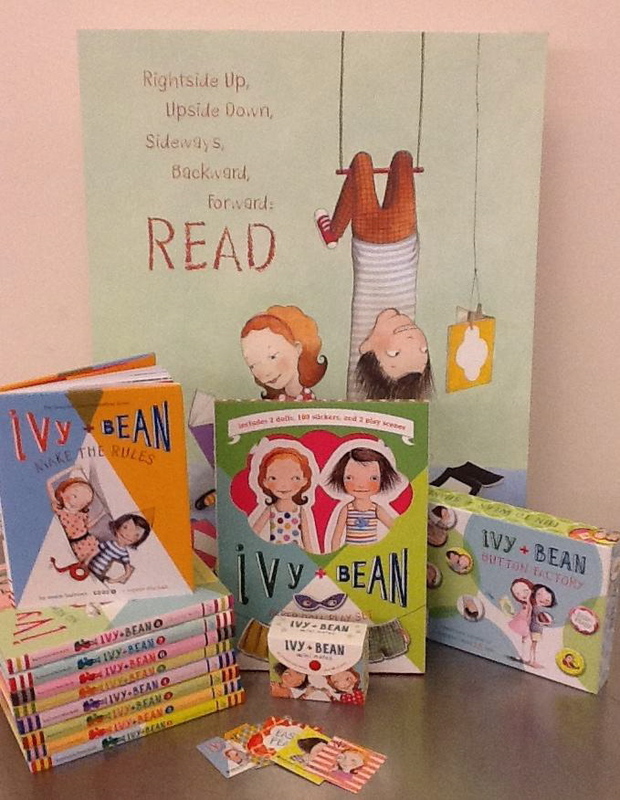 Week 2’s contest is still running and there will be lots more Ivy and Bean to give away! Thanks for stopping by everyone and happy reading! 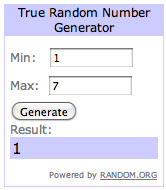 I numbered the comments from 1 to 7 (discounting the second comment by the same person) and put the numbers into a random number generator at random.org. If you want to read all the detail stuff, do so here. A lie about cartwheels–and it could be yours for free! Ivy and Bean are outside with the rest of the gymnastics club. They are taking turns doing cartwheels. Bean does one and then sits down, somewhat dizzy. Emma does nine in a row. Zuzu does twelve plus a backbend. And when it’s Ivy’s turn, she says she is guarding the jackets. When others protest that you can’t be in Gymnastics Club if you are just going to guard jackets and start to doubt whether Ivy can even do a carthwheel, Bean intercedes. Ivy, who has never done a cartwheel in her life, is surprised by her friend Bean. But any reader with a good friend—the kind of friend who has your back, the kind of friend who doesn’t hesitate to lie about your cartwheeling ability, won’t be surprised at all. And it is this powerful friendship that I love so much about these books. “Like I was saying, I can’t do a cartwheel at the moment,” said Ivy. “Why?” asked Zuzu with her hands on her hips. “Because,” Ivy said, “we’ve got an emergency situation going on. Right over there.” She pointed. 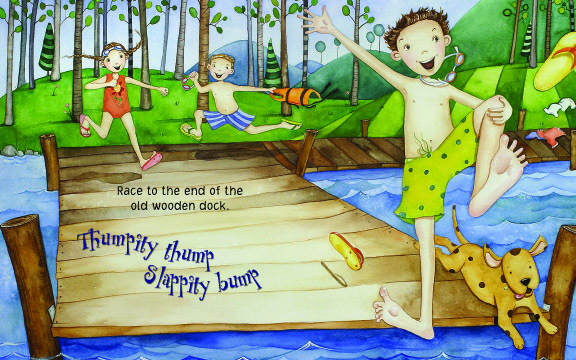 Emma, Zuzu, and Bean followed Ivy’s pointed finger across the playground. She was pointing directly to the girls’ bathroom. The one right outside their classroom. And for ideas about things to do with your kids, check out this page on Ivy and Bean’s way cool website!